Born in Avezzano on the 2nd of June, 1995, grown up in L’Aquila. Photographer and documentary filmmaker, she studied for three years photography between Bologna and London, with on the ground experiences as a photoreporter for social and journalistic projects. She then moved on studying Documentary at London Film Academy, where she wrote and directed her first short documentary: “The Militant”. Nowadays she is a student at the university of Bologna, and she is working on writing and directing her own ideas. 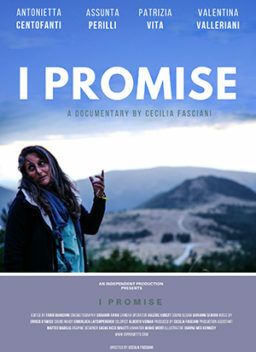 Her first long feature documentary “I promise” is currently in distribution.